Manor Farm Cottages01430 873510work Self-cateringDeep in the heart of rural East Yorkshire, Manor Farm Cottages are two beautiful retreats nestled in Goodmanham village at the foot of the rolling Yorkshire Wolds. Set in 23 acres of private rural countryside, and within easy reach of the very best that the region has to offer, you'll find awe-inspiring scenery, quaint market towns, picture-postcard seaside resorts and must-see tourist spots all on your doorstep. 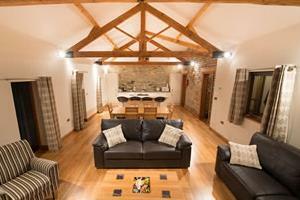 The Cottage and The Stables offer modern 4-star luxury accommodation in a wonderfully quiet location with superb views. We've gone to great lengths to make your stay as comfortable as possible. After all, just because you're in the countryside, it doesn't mean you have to miss out on those touches of luxury. If you want to discover for yourself just why Yorkshire is known as 'God's Own Country', Manor Farm Cottages are the perfect base. The lounge area has two large 3-seater sofas, providing plenty of room to relax along with the 32" High Definition TV, Blue-Ray player and Wi-Fi to keep you entertained. Our kitchen is fully equipped with everything you could need to eat in including an oven and hob, microwave, fridge, freezer, dishwasher, as well as cutlery, crockery and a range of cooking utensils. There's also a washing machine should you need to use it. The Cottage has two comfortable sized bedrooms, both of which feature full length windows providing plenty of light. The master bedroom has a double bed, a gent's wardrobe, chest of drawers and a dressing table - there's also plenty of room for a cot which we can provide if needed. The smaller bedroom has twin beds (which can make a double), a gent's wardrobe and 2 bedside tables with touch lamps. Two sets of bath towels are provided on your arrival for you to take advantage of the bathtub - perfect for a long soak at the end of a hard day exploring. The bathroom also has a walk-in shower if you need to freshen up quickly. If the sun is shining you'll enjoy making great use of your own private outdoor area, which has a patio table and chairs and a BBQ, perfect for al-fresco dining. The kitchen area provides everything you may need during your stay, fitted with all standard kitchen appliances as well as being equipped with a full range of cutlery, glassware, crockery and cooking utensils. There is a separate utility room off the kitchen area which contains the washing, drying and cleaning equipment. The lounge is the perfect area to unwind after a day exploring everything The Wolds has to offer, whilst relaxing you can enjoy the stunning views through the full length glass windows. In the middle of the room is an oak dining table with six chairs. The master bedroom is very spacious with a king size bed, full length wardrobe, bedside tables and a set of drawers with a full length mirror and chair. There's also plenty of room for a cot - which we can provide if needed. The master bedroom also boasts and excellent en-suite bathroom with toilet, shower cubicle and sink. All bed linen and bath towels are supplied.